Imagination - Creativity - Innovation "The more complex the world becomes, the more creative we need to be to meet its challenges...When people find their medium they discover their real creative strengths and come into their own. Helping people to connect with their personal creative capacities is the surest way to release the best they have to offer." Sir Ken Robinson. 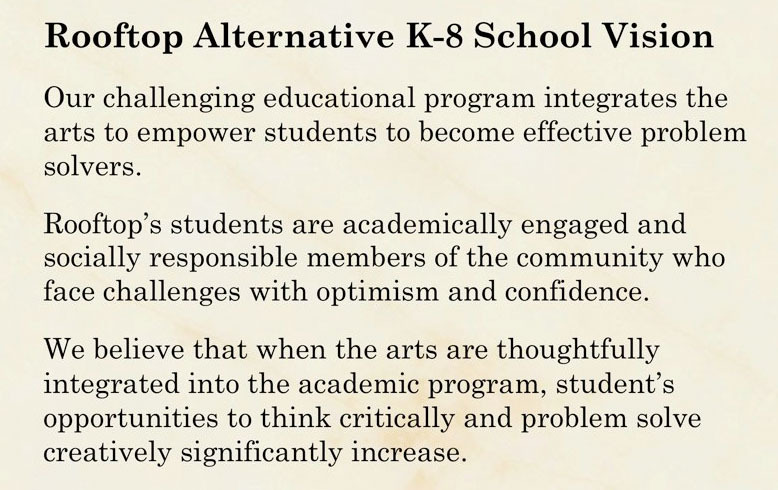 At Rooftop, we focus on looking at the whole child, integrating art with education. Learning by doing, encouraging creativity and self expression continues our Rooftop spirit! See Rooftop's mission statement here. At the Mayeda Campus, art is a core curriculum class for the 6th, 7th and 8th grades. 7th and 8th graders have art daily and 6th grade rotates during the week. Here the students continue and extend the creativity, expression, and enjoyment of the arts that were already grounded throughout their experience in their K-5th grades before them. As stated in the NCCA (National Coalition for Core Art Standards) research :“creative practices of imagination, investigation, construction, and reflection are essential to arts practice across the discipline ...each of which transfers to all aspects of learning and life in the 21st Century.” The upper grade art classes provide multiple entry points with student's own questions and inquiry. Art engagement promotes problem solving and taking risks and seeing how“mistakes” are actually opportunities for experimentation. Engaging and persisting, reflecting and evaluating are all important life skills the arts try to develop. Looking at life from multiple perspectives as well as multiculturally encourage empathy, connections and community. And trying multimedia or different ways of expression allow for many levels of communication. Real world content and personal expression attempts to keep the art relevant and integrated with many curricular areas. Students can realize how art can not only empower themselves but it can also promote social change by using innovative critical thinking outside of the box. Collaboration and learning from each other is stressed. We hope the arts help build awareness of the importance of creativity and self expression, the freedom of imagination, and the transformational innovative spirit necessary for our students to gain better understanding of themselves, and the world around us.